This side screams, “celebrate the season”... Well it would if it could talk! It's got toothsome rice, savory cauliflower, sweet onions and a Tahini lemon dressing that is good enough to spoon onto just about anything. You can easily substitute any grain that's tickling your fancy; quinoa, buckwheat, and even lentils would be perfect in this dish. You can swap cilantro for the parsley and then drizzle with Beyond The Olive Cilantro Lime Olive Oil, mix and match spices/salts. Don't have Za'atar? Use cumin instead. If you don’t care for raisins, dried cranberries or cherries would be excellent in their place. Let your taste dictate the details. 1. Preheat the oven to 400ºF. Chop the cauliflower into small florets and place them on a large baking sheet. Slice the red onion into 1/4-inch strips and place them on the baking sheet. Drizzle the cauliflower and onions with olive oil and season with a pinch or two of salt and pepper. Toss the cauliflower and onions until coated in oil, salt, and pepper. 2. Roast the cauliflower and onions in the preheated oven for 20 minutes, then stir, return them to the oven, and roast for an additional 10-15 minutes, or until the cauliflower is tender and browned on the edges. Let the cauliflower cool slightly. 3. While the cauliflower and onions are roasting, make the lemon tahini dressing. Add the tahini, water, lemon juice, garlic, cumin, cayenne, and salt to a blender. Blend until smooth, then refrigerate until ready to serve. 4. Cook rice according to package directions (feel free to use stock instead of water and throw an extra clove of garlic in there just for good measure) Once cooked, drain rice, let cool. 5. Pull the parsley leaves from their stems and roughly chop the leaves into small pieces (about 1.5 cups loosely packed, once chopped). 6. 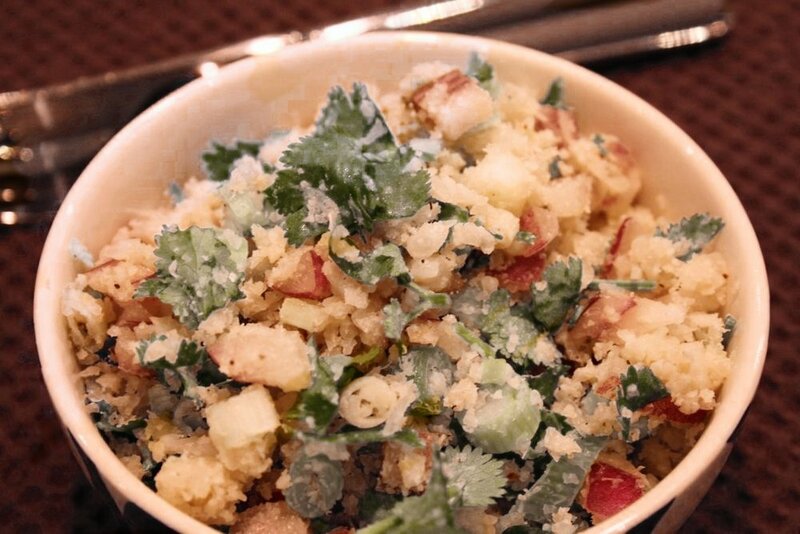 To build the salad, combine the roasted cauliflower and onions in a bowl with the rice, raisins and chopped parsley. Drizzle the lemon tahini dressing over top, and toss to combine. Serve warm or cold.